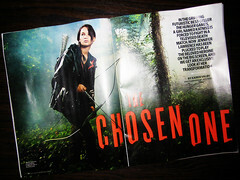 This past summer Jennifer Lawrence brought sixteen-year-old action hero Katniss Everdeen to millions of tweens. This past Sunday she brought home the Best Actress Oscar for Silver Linings Playbook. Which, in the free association game that is my media-addled brain, reminded me of Brad Dourif. You know, Wormtongue. Or Doc from Deadwood. Or that creepy Luther Lee Boggs for the Xphiles out there. Like Lawrence, Dourif won Oscar-recognition early. His work as Billy Bibbit in One Flew Over the Cuckoo’s Nest garnered a Best Supporting Actor nomination for Dourif at the ripe age of 25, the actor having made only two pictures before then. Years later, he was nominated for a Best Supporting Actor Emmy for his work on Deadwood. In the years in between, he collaborated with celebrated director David Lynch. So if you’re intrigued–as I am–by the relatively few actors who work in the realm of both acclaimed and pulpy entertainment, maybe a little Dourif should be in your future. One Flew Over the Cuckoo’s Nest–one of the only movies in history to sweep all five major awards at the Oscars–is a classic worth the re-watching. If you haven’t seen it before, maybe you should. And if all those Oscars alone aren’t enough to entice you (it’s true, after all, that all that glitters is not gold) decide to watch it for Brad Dourif. For me, it’s not the legendary, Oscar-winning Jack Nicholson whose performance sticks with me until days later. That award goes to Dourif. His Billy is the heart of the picture and an exquisitely fractured one at that. His performance is innocent and haunting and surprising and heart-breaking. And his hair is amazing, too. yeah, he’s the character I remember from that movie. He is one of those characters that like, ALWAYS stick with you, and sort of even, haunt you. Amazing performance. so sad that he never got any other super great roles like that again. Chucky was probably his doom. Couldn’t agree more about the staying-power of Dourif’s Billy. If you haven’t seen Deadwood and have the wherewithal to get used to the 19th C English, I’d highly recommend it. For me it was a “finally!” moment to see Dourif in action as the Civil War-scarred, mining camp doctor.